What is the best way to stop taking Lexapro 10mg? Will I have any side effects or withdrawal symptoms? 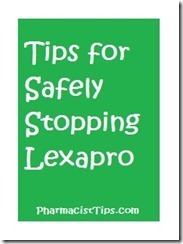 Is it ok to Stop Lexapro 20mg cold turkey? First of all, Lexapro [escitalopram] is SSRI or Selective Serotonin Reuptake Inhibitor. It is used to treat depression and anxiety. It is available in 5mg, 10mg and 20mg tablets. It is usually taken once a day. Withdrawal symptoms can occur if Lexapro is stopped cold turkey. Symptoms can include flu-like symptoms, difficulty sleeping, headache, nausea, racing heart, agitation, muscle pain, and weight gain. Other side effects of stopping the medication can occur. A University of Calgary article suggests that the medicine be tapered or slowly weaned down if the person has been taking the medication daily for at least 6 weeks. Obviously, if the person is experiencing severe side effects the medicine will need to be stopped immediately and withdrawal symptoms will most likely occur. Theses are some ways escitalopram may be discontinued. 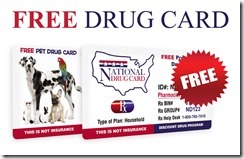 Do not attempt to stop the medication without the consent of your doctor or licensed healthcare provider. Mild withdrawal symptoms will mostly likely occur even when the medication is tapered, contact your doctor if you feel the symptoms are intolerable – they may switch you to a medication with fewer withdrawal symptoms like fluoxetine. Stopping Lexapro 20mg daily. Reduce the dose over 4 weeks. 15mg a day for 7 days. 10mg a day for 7 day. 5mg a day for 7 days, then 2.5mg a day for 7 days, then stop. If withdrawal symptoms occur the taper may need to be extended. 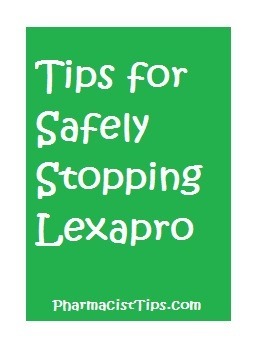 Stopping Lexapro 10mg tablets. 7.5mg once a day for 10 days. 5mg once a day for 10 days. 2.5mg once a day for 10 days, then stop. Taper may need to be extended if withdrawal symptoms occur. Stopping Lexapro 5mg daily. 2.5mg once a day for 7 to 14 days, then stop as tolerated. If depression symptoms are still present, your doctor may slowly start you on a new medication as the Lexapro is decreased. Always contact your healthcare provider before starting or stopping medications. Talk to your doctor or pharmacist if you believe you may be having side effects from any medication.